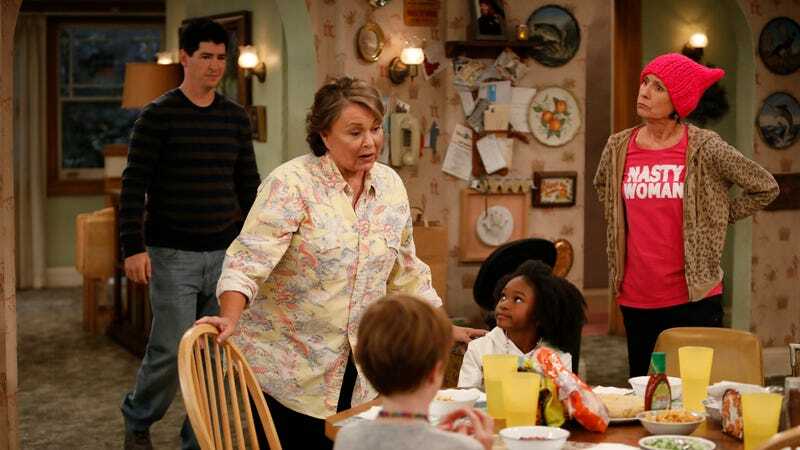 The show’s justification for TV Roseanne’s love for Donald Trump came in the new pilot, when she explained that she was drawn to him because he “talked about jobs.” One of the former writers said it seemed like the new staff had simply “picked an aspect of what Trump was saying that would fit into the original Roseanne character” in order to align her a bit with Barr, even though doing so meant ignoring some stuff that the original version of Roseanne “would’ve questioned”—like how a rich guy like Donald Trump would have any awareness of what life is like for a family like the Conners or how he’s a big racist and misogynist. Another writer, who chose to remain anonymous because they work in TV, pointed out that ABC pulled a Black-ish episode about NFL players kneeling during the national anthem but it’s perfectly willing to give Barr a platform even as she accuses Parkland survivor David Hogg of doing a Nazi salute on Twitter. Of course, it’s also worth noting that at least four other writers who worked on the old Roseanne did return for the new show, and while the four BuzzFeed spoke to are disappointed that right-wing politics have infected the series, they all seem pretty happy with literally everything else about it (which is a common reaction, apparently).